I’m a reasonable person. I like animals. I like nature. I like both best when they remember their place; their place being, namely, not inside my house. It has become apparent that not only are my wishes not being considered, they are being flagrantly flouted and thrown back in my face. Now, I know snakes serve a purpose in the environment, and I respect that. I adopt a “live and let live” approach to snakes. I have no desire to seek them out and harm them; nor do I believe in hurting them simply because they had the bad luck to wander across my path. However, I’m a bit irritated about the entire encounter. There was really, truly no need for homeboy to roll up on us like that. We have nothing in the house for him to eat. His fortunes are much more promising in the great outdoors. And yet, there he was, in defiance of nature and everything I have ever hoped or desired for my place of residence. Anyway, one broom and one dustpan later and Mr. Hissy has moved on. But I honestly don’t know if I can adequately express how disturbing I find this. You see, this isn’t the first snake we’ve found in our house. 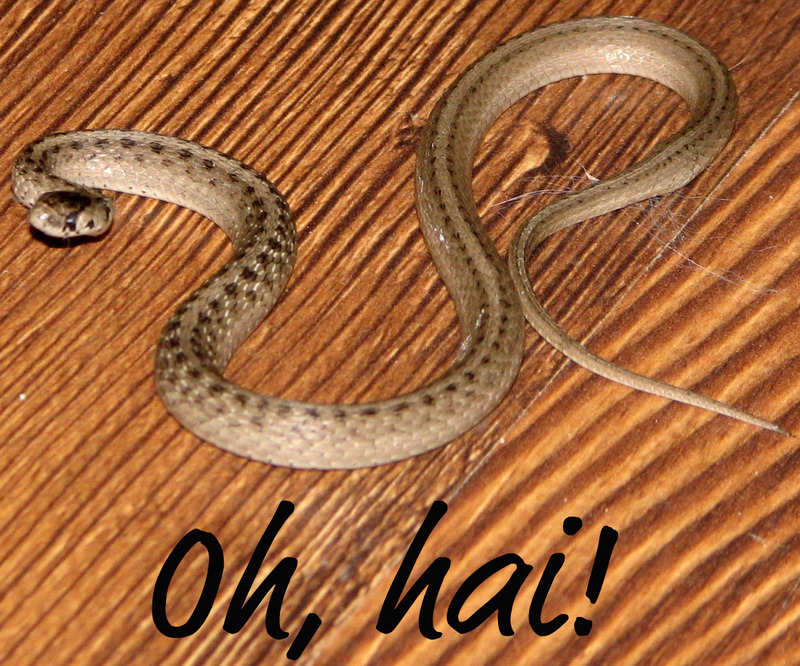 It’s not even the first snake we’ve found in our house this spring. This guy was #2. The first one had the decency to be deceased when we found it (probably thanks to one of the Mighty Feline Hunters, or possibly it took one look at our garbage dump of a house and killed itself in despair). I’m really worried that this is going to become some kind of pattern. Maybe they’ll start coming up out of the plumbing next. Wouldn’t that be charming? My other theory is that tonight’s snake was a relative of snake #1, come to avenge his death. In which case I guess we can count on seeing him again someday. It’s a shame I don’t speak Parseltongue; perhaps I could’ve discerned a faint Schwarzenegger-esque hiss of “I’ll be back!” as I flung the contents of the dustpan into the stratosphere. Mary!!! I am so glad that you have such a “sense of humor” of the situation. I think I would have had a full blown panic attack, or heart attack! lol I wish I wasn’t that afraid, but wow! I hope this is the last you see of the suckers! Do you know what kind of snake he was? Please tell me the picture isn’t of your your snake. Yikes! Yes, that’s him, the ungrateful wretch.